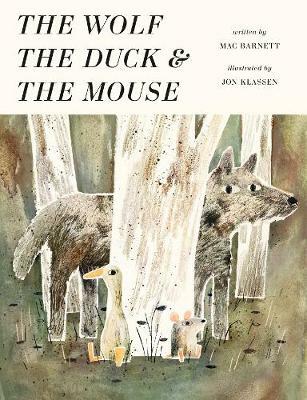 When a woeful mouse is swallowed up by a wolf, he quickly learns he is not alone: a duck has already set up digs and, boy, has that duck got it figured out! Turns out it's pretty nice inside the belly of the beast - there's delicious food, elegant table settings and, best of all, dancing. 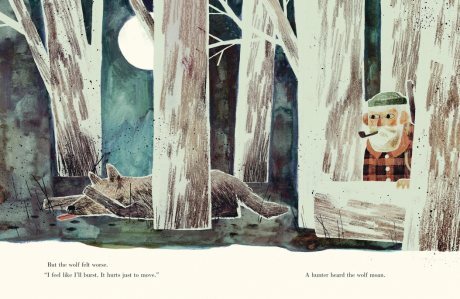 With a nod to traditional fables and a wink to the reader, the award-winning Mac Barnett and Jon Klassen of Sam and Dave Dig a Hole, Extra Yarn and Triangle offer a tale of cooperation and creative cuisine that is sure to go down easy. One day a wolf found a mouse and gobbled him up. 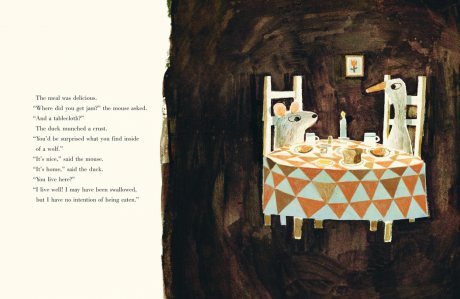 When the mouse reached the wolf’s stomach, he discovered that he wasn’t alone, there was a duck asleep in bed. ...sounds simple enough but it isn't! I was lucky enough to get my hands on an advance reader copy of this book and to win a prize bundle which myself and a younger cousin have been very happy about!